If you’re business is expanding in the international market or relying more heavily on overseas payments, it might be time to look into the advantages of an international processor. Credit cards are international, and your business needs to keep the pace with advanced technology in global transactions. There are many benefits for you, your business and your customers including increased security, customer satisfaction, great service, fast processing and developing a relationship with banks in the global market. Customers pay in their own currencyIn order to simplify payment methods, an international credit card processor will allow your customers to pay in their current country’s currency – avoiding confusion or delays. The customer becomes more secure in their purchase as well as your business. Lastly, this will show you prioritize your customer’s convenience because you’ve simplified the process of their payment. Access to global banksAn international processor will take care of the leg work for you when it comes to working with banks around the world in a effective and simplified way. Finding a merchant account provider with an established international presence means you’ll have an easier time maintaining a good relationship with these banks, ultimately contributing to a bright future for your business in the global market. 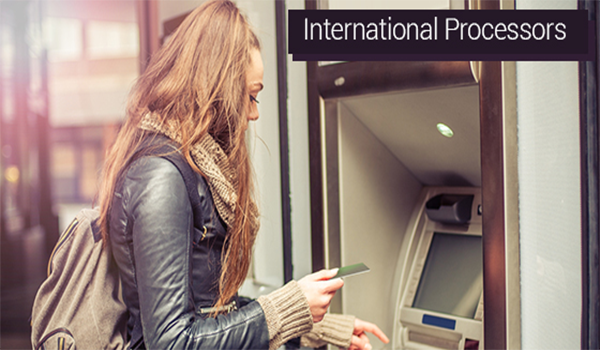 Customizable serviceInternational payment processors are knowledgeable of a wide range of industries and are experienced in handling their specific needs. When a processor understands your business, they can better estimate the associated risks and ensure secure and reliable transactions. This will ensure your business will continue to grow and be successful while managing the risks associated with overseas business. Faster offshore processingUsing secure gateways and connections, an international customer can quickly relay online payments to the correct banks and processors. An experienced processor can quickly and effectively handle offshore processing times successfully, enabling you to expand your business and develop positive relationships with consumers and banks. International processors ensure a smooth transition into global markets and bring your business to the next-level in its ventures. Understanding the advantages of an international processor, such as those listed above, will help you decide if utilizing this crucial tool is right for your business. If you’re looking to access any of these advantages but don’t know where to start, contact an experienced merchant account provider with experience in international markets.